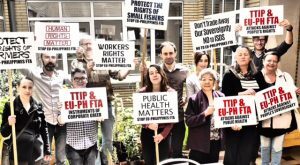 A secret negotiation for a EU-Philippines FTA is a threat to access to medicines, fisheries, jobs, right to regulate and human rights claim Filipino trade campaigners during 1st round of negotiations in Brussels. On 23 May, The Philippines and the EU began negotiations on a comprehensive Free Trade Agreement (FTA) in complete secrecy. “Despite the promises of increase transparency in trade talks by the European Commission, the round of negotiations was not publicly announced, there is no information where the negotiations are taken place, and there are no details of the EU mandate for these negotiations” said Marc Maes of the Belgian NGO umbrella 11.11.11. “We believe that this agreement that will be negotiated with the EU, with its TRIPS+ provisions under the IPR chapter will go against the spirit and the letter of our Cheaper Medicines Law and will have push back efforts to ensure access to affordable medicines for millions of poor Filipinos”, said Health and women’s rights advocate Ana Maria Nemenzo. “There is a fundamental flaw in the logic of a labor clause in FTAs. Labor clauses are supposed to protect the rights of workers. But how can we protect their rights if the whole FTA itself will lead to the destruction of their jobs? This is why labor clauses in FTAs have failed to improve the rights and welfare of the workers of the participating countries. At best, labor clauses are used to deter the labor movement’s resistance to an FTA”, said Josua Mata, of SENTRO. “The issue of fisheries is not only managing fishes but mainly addressing the unjust management of fisheries including the unequal distribution of the bounty of the seas. This is the reason that artisanal fishers remain poor. The amendments to the Fisheries Code on illegal, undocumented and unreported fishing (IUUF), pushed by the EU do not address the issue of human rights in the fishing industry”, claimed Pepe Tanchuling, Executive Director of Tambuyog Development Center. “While we support stronger EU-Philippines relations, we question the direction of strategic partnership, a partnership that is driven mainly by the corporate interest. We feel that this will not lead to equitable and sustainable development but to greater wealth concentration and inequality, destruction of the environment, and the erosion of peoples’ rights.” said Joseph Purugganan, Philippine program coordinator of think tank Focus on the Global South. “The EU’s Trade Commissioner Cecilia Malmström was crystal clear and unapologetic in her push for the corporate interest in these talks. These talks that began this week in Brussels are clearly about the securing the interest of EU corporations. The ambitious agenda for greater investor rights as enshrined in the investment chapter and the investment court system will be pushed aggressively in these talks in the name of the corporate interest,” added Mr. Purugganan. “A new administration under President-elect Rodrigo Duterte is upon us and I think it would be wise for the EU to make the necessary steps to conduct a human rights impact assessment prior to proceeding further with these talks.”, said Joseph Purugganan.